That the debate over the art/kitsch divide has been theorized since at leat the 1930s shows that the supposed divide is arbitrary and the argument then breaks down into relativism. Like industrial culture production, the argument itself is of itself. To exist, it must already belong to the existing argument, otherwise it has no historical reference and the argument collapses. Unlike craft, kitsch cannot be defined by the intent of its creator. It is an outward-inward categorization that ignores embedded meaning planted by the creator. It is instead demarcated by an outside observer, who judges it to have no “pure” cultural value. Whether this is due to funcionality, quantity, or aesthetics, the judge claims it lacking in qualities needed to elevate it into true art. In modern times, the art/not art battle rages on through technology-based art. The industrialization of culture, specifically post-war culture, wherein normative benchmarks measure the acceptable deviation range allow for new correlaries through technology. What once was mass-produced physically on assembly lines is now (theoretically) endlessly able to reproduce itself through digital copies. This includes pixel-based images as well as digital-physical production methods, such as 3D printing. In the mid-20th century, artists avoided the production of kitsch, but since artists like Jeff Koons and Damien Hirst began to break the normative benchmark by intentionally producing “non art,” the range of acceptable mutation has grown almost to the point of meaninglessness. 3D-printed art relies almost entirely on the intent of the creator to define it as pure art and not kitsch. 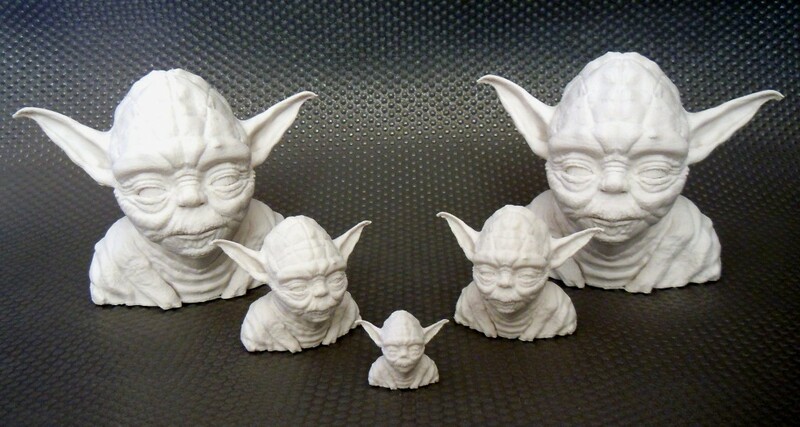 Most 3D-printed objects could be defined as kitsch in that they are representations of mass culture intended to be easily digestible and not require difficult thought to comprehend: to which thousands or perhaps millions of almost-identical 3D-printed Yoda busts can attribute. When peasants are able to download a digital model of artwork and reproduce it at home to near-exact tolerances, the distance between art and kitsch begins to narrow. That gap again narrows when considered against the previous need to be educated to understand or have access to pure art: 3D printing requres a degree of education and technical know-how previously thought unavailable to or lacking in presence among the kitsch-consuming peasants (as Clement Greenberg calls the public-at-large). Now, peasants can produce their own (low) culture. 3d printing now encompasses many of the struggles that existed with another formerly-new culture system: photography. Where is the value in a photograph if it can just be reprinted? The same argument applies to 3d printing. Through the years artist photographers have (mostly) sidestepped this issue through ideological cosensus and the forced scarcity of producing a limited number of physical prints. The art world considers a photograph art through comparison to various normative benchmarks, such as technical skill and content. However, the desire to succinctly categorize photography as art or not again breaks down to relativism when considered alongside non-art photographs that meet the same criteria. 3D-printed objects face similar challenges that artists are still trying to solve. Due to its newness, artists are applying various techniques to force value onto their culture objects. Some follow suit with photographers and promise to make only a limited number of duplicates, or even unique objects. Others are considering the by-hand post-processing of 3d-printed objects to transform a replicable object into a unique one. Others still are using 3d-printed objects in mixed-media works as a single element among others. In this sense, the 3d-printed object piggybacks onto previously-accepted benchmarks for acceptable pure art.